The Brethren of Valley Lodge No. 90 in Berwick, N.S. 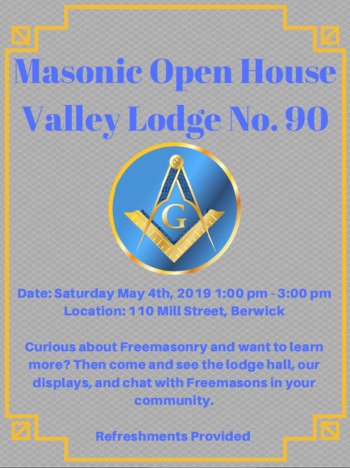 are opening their doors to the public, and will be there to answer visitors questions about Freemasonry. Many of our new members are young men in their 30's looking to belong to something larger than themselves, and wish to spend time with others who share their morals and values. Maybe YOU might be interested? Displays will be set up, and members will be on hand to chat about the world's oldest and latest fraternity.